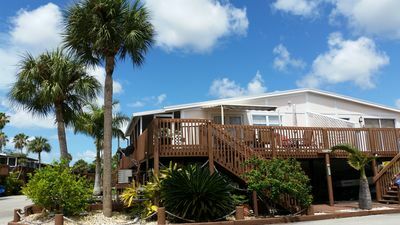 You will be surrounded by nature at our waterfront condo at Port of the Islands, close to Marco Island and Naples beaches as well as Everglades National Park. Watch majestic sunsets over the serene big bay of the Faka-Union Canal which flows into the Gulf of Mexico. Bird watchers will enjoy the array of shore birds feeding just feet away from your large screened lanai. 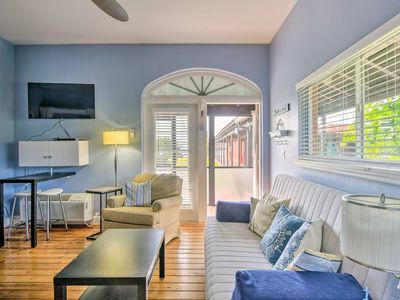 Our casual and cozy coastal retreat offers all the comforts of home including an open floor plan with a large fully equipped kitchen, high speed WiFi, and flat screen Smart HD TVs with Xfinity cable service in the living room and bedrooms. Decorator furnishings blend beach-style with antique and accent pieces from the owner's international travels. You'll appreciate the new washer and dryer, central air conditioning and heat (rarely needed), and stylish, quiet ceiling fans throughout. The master bedroom has a queen-size bed, a large ensuite bathroom with a shower and double sinks, walk-in closet, and sliding glass doors to the lanai for enjoying a fresh breeze with your morning coffee overlooking the water. The second bedroom offers two extra-long twin beds which can also be arranged as a comfortable king bed. This second floor unit offers sweeping views of the water and adjacent wildlife preserve. Just steps away are the private community amenities including a large heated pool, whirlpool, and tennis courts. There is excellent fishing from the shore (both fresh and saltwater species). The Faka-Union canal is a wintertime haven for dolphins and manatees, which are often seen in the spillway area from the community pool deck. Launch your own boat or rent one by the day at the Port of the Islands Marina just across the road, which also offers manatee viewing and eco-tours of the Ten Thousand Islands National Wildlife Refuge. We include use of bicycles, a kayak, tennis rackets, fishing rods, and beach gear. The Angler’s Cove restaurant and lounge at Port of the Islands (POI) Resort just across U.S. 41 features a casual, friendly atmosphere for lunch, dinner, cocktails, and live music. The POI Marina Store stocks convenience foods, dry goods, and fishing bait. You can feel safe knowing there's a community fire station just across the road with 24/7 emergency medical service and the Physicians Regional Medical Center on Collier Blvd is 20 only minutes away. Relax in a quiet, natural setting with all the comforts of home. While off the beaten path, you are close to Marco Island and Naples beaches, shops and restaurants, and Everglades National Park. Other nearby activities include golf at The Links of Naples and other courses just 10 minutes away, a shooting range, air boat tours, Seminole-Collier State Park nature trails and kayak rentals, boardwalks and biking in Big Cypress Preserve and Everglades National Park, boating in the pristine Ten Thousands Islands National Wildlife Refuge, and Everglades City has a history museum and excellent fresh seafood. Our community at Port of the Islands is just 15 minutes from all the shops and restaurants near the intersection at U.S. 41 and Collier Blvd, where you'll find groceries at Publix, Fresh Market, and a Walmart Supercenter. There's also a CVS, Walgreens, Lowe's, discount and outlet stores, and multiple gas stations and convenience stores. Also by U.S. 41 and Collier Blvd, you'll find fast food eateries including Starbucks, McDonalds, Panera, Burger King, Chipotle, Pei Wei, Pollo Tropical, and Dunkin' Donuts, plus restaurants like Texas Roadhouse, Carrabba's Italian Grill, and Outback Steakhouse. Good local seafood restaurants include Little Bar and Crabby Lady in Goodland, the Island Gypsy and Pelican Bend at Isle of Capri, and Snooks on Marco Island. Our place is an easy drive to everything you need, but without heavy traffic or crowds. Come enjoy this perfect Florida retreat with nature, serenity, sunsets over the water, and solitude in abundance. This furnished 1,400 s.f. one story townhouse was built in 2003 It has central air. Water View from most of the unit. Laminate floors and carpet. Master bathroom has a tub and a shower. Second bathroom has tub only. Dining area, open kitchen, screened lanai. Spilt Bedrooms are large and on separate sides. Very Private Great room. + Garage + Laundry The area is hotel style. Port of the Islands is a tranquil boat community, which offers great boating out to the Gulf with no bridges, has a marina, with dock master, shopping and boat rentals, restaurant and much more. 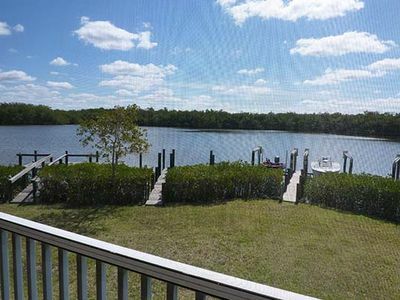 Manatees come and go, and FISHING is great from the dock behind your unit. Pool Restaurant and Gift shop available. The beach in Marco Island is approximately 15 minutes away. Lots of Restaurants and shops. Relaxing is the best for the soul. 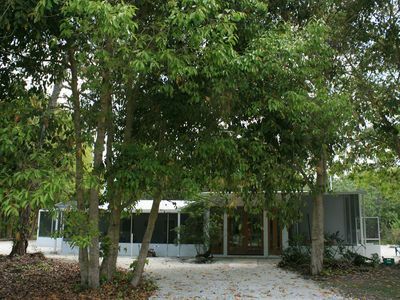 Just 20 miles from south cosmopolitan downtown 5th Avenue and Naples white sandy beaches. Beautifully furnished 2 Bedroom plus den/office and 3 Bath. This is a fisherman's paradise. Bring your own boat and there is guaranteed to be an adventure every time. 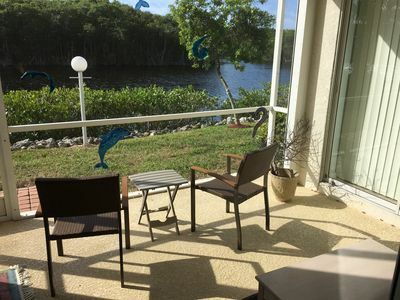 View families of Manatees from the balcony while sipping on your coffee every morning. See the occasional Bottleneck Dolphin, Tarpon and Alligators all in the same morning. While out fishing in the gulf, you will see many dolphin, shark and even sea turtles. Our fishing development is nestled a short 15 minute drive from Marco Island or you can go by boat! Let us know if you have any questions. Enjoy! 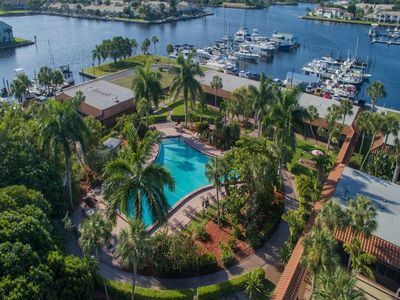 Bright, Beautiful and Spacious 3/2 condo overlooking the marina in Port of the Islands with a one car garage and private dock. 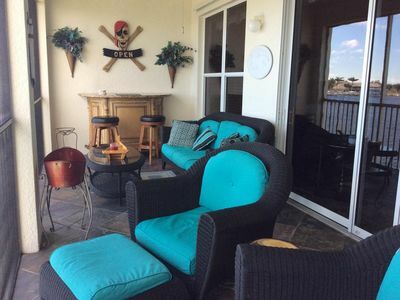 This property is a beautifully updated 3 bedroom 2 bath condo in the Sunrise Cay section of Port of The Islands located on Tamiami Trail 20 minutes east of Naples. You park in the drive way and enter the condo though the garage or front door into the foyer which leads up to the bright open living room. There you will find a beautiful unobstructed view of the marina. The lining room opens on to a screened balcony with a dining table for relaxing and watching the boats go by. Next to the living room is a fully appointed kitchen with all the appliances, dishes, utensils and cookware that you would need to prepare delicious meals for you, your family and guests. In the kitchen there is a table that seats 4 and counter with stools so that you can sit and talk to the cook, all with a view of the marina. There is also a separate dining room next to the living room and a seating area that provide a lot of room to spread out and relax. The condo can sleep six comfortably. The floor plan is split so the master bedroom and bath are on one side facing the marina and the 2 guests bedrooms are on the other side next to the other bathroom. The master bedroom has a king size bed with a walk in closet. The on suite master bath has a large walk in shower, along with a double sink vanity. The second bedroom has a queen bed and the third bedroom has two twin beds. The condo is a few short steps from the heated community pool and directly across from the boat dock. There is direct access to the gulf with no bridges. The boat slip is large enough to hold up to a 22 ft boat. 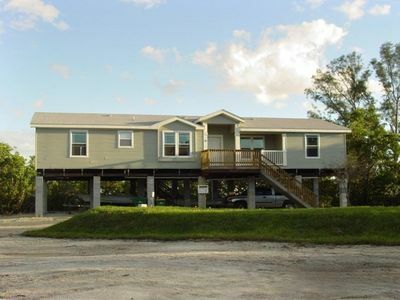 This property offers all the comforts of home in the peaceful natural surroundings of the Everglades. Yet you are less than an ½ hour away from Naples and Marco Island to the west and 2 hours from Ft Lauderdale and Miami to the east. The keys are a short day or overnight trip as well. 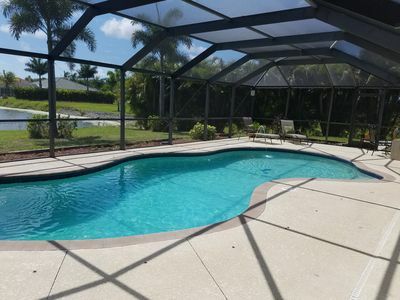 This location gives you easy and affordable access to all the best Florida has to offer. This 2 bedroom, 2 bathroom condo is located in the Port of the Islands community. The master bedroom is equipped with a queen sized bed, walk in closet, secondary closet and master on suite with large walk in shower and additional closet for towels and linens. The second bedroom is equipped with a large desk for home office and futon style couch, which pulls out to a double sized bed and large closet. The guest bathroom is equipped with a tub/shower. The unit also contains a washer and dryer. The kitchen has a serving window for an open view into the living room, patio, and outside. The unit is situated with a view from the patio of pristine mangrove forest behind the Faka Union river. A large table and chairs allow guests to enjoy their meals while appreciating the wildlife and scenery. 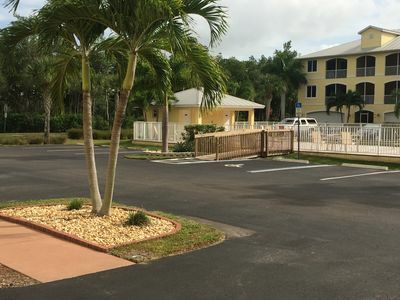 The community also offers several ammenities, such as a community pool, marina, boat ramp, and fitness center with tennis courts (paid seperately). This is the perfect gateway to the Everglades National Park, 10,000 Islands, Fakahatchee Strand, Big Cypress and much more! Located near the 10,000 Islands and east of downtown Naples, Port of the Islands is a small community surrounded by canals and mangroves. Fishing, boating, watching the manatees, and laying by the pool are just a few of the possible activities. 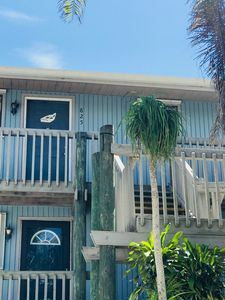 Live music and poker nights are offered at the nearby hotel This 3 bedroom, 2 bath condo is only a few yards from the dock and offers instant fishing access and its own boat slip. The community pool is easily accessible, located right outside the front door. 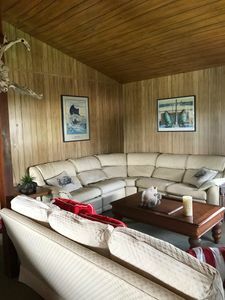 This waterfront home offers a mater bedroom, a second room with twin beds, and a third bedroom with tv and couch that folds out into an additional bed. An in home washer dryer, a kitchen with plenty of amenities, and a supply of towels and linens will help you settle right in and feel at home. A beautiful view of the water right outside the lanai and master bedroom provides a peaceful way to wake up in the morning and relax at the end of the day. 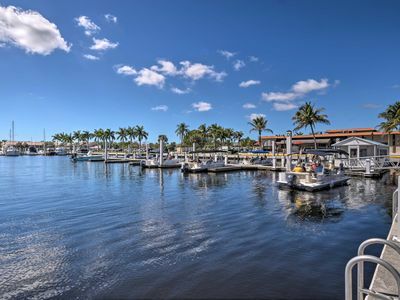 Port of the Islands is a direct access to the Gulf of Mexico and the famous 10,000 Islands boating and fishing community in Naples, FL, at the edge of the Everglades surrounded by miles and miles of protected lands. 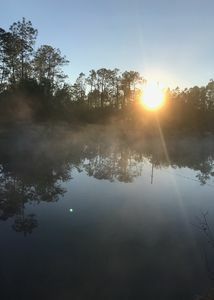 This is old Florida. Tranquility, peace and quiet just 20 miles south of cosmopolitan downtown 5th Avenue and Naples white sandy beaches and 15 miles from Marco Island. 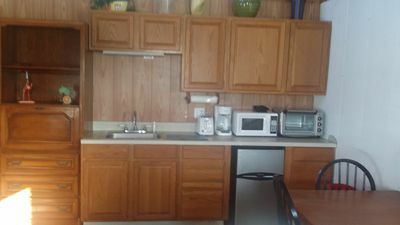 The condo is fully furnished with complete kitchen, bedding, towels, washer and dryer. 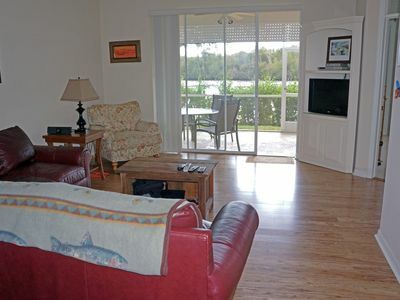 There is a lanai/porch from which you can gaze upon the water, mangroves and wildlife. Watch the manatees play, gators cruise, even the dolphins make their way up the channel. The property has a swimming pool and there are walking trails nearby. There is a full service marina for boating needs. Fish for tarpon, snook, redfish, snapper, pompano, cobia, triple tail and sea trout. A hidden jewel in the everglades between Miami and Naples in a little fishermen's town called Everglades City. The house is right on the water and has a boat dock. Easy access to the Ten thousand Islands and Golf of Mexico. This secluded property is ideal for people that love nature, fishing and want to relax away from all hustle and bustle. 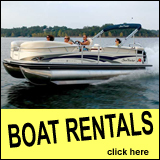 Airboat, Eco tours, hiking, canoeing and fishing tours businesses are nearby. 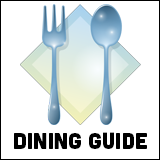 Excellent seafood in nearby restaurants. After all Everglades City is the Stone Crab Capital of the World. The house has a light and airy décor , screened porch. Satellite TV and WIFI. Plenty of parking for cars and boat. House is on stilts and has two access points via stairs. Everglades City is located about 32 Miles east of Naples on the West Coast, about 80 miles from Miami on the East Coast. Marco Island is a 20 minutes drive from us. 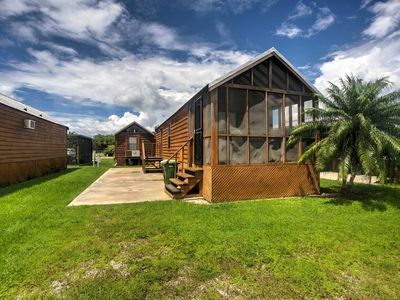 Newly remodeled home nestled on a quiet, peaceful nature preserve, located in the Big Cypress Preserve, on the Florida Panther Corridor, in the heart of Everglades National Park which encompasses over 700,000 acres. It's also located on the Florida Great Birding Trail! Join the few naturalists to experience pristine Florida at it's best. A large variety of flora and fauna in different sections of the park. Literally step outside the home to hike and photograph in every direction!! You can hike through the grasses or hike on the old swamp buggy trails. The trails are rugged and used by the native critters in the area. The property is a very spiritual place encouraging meditation. The hard packed limestone rock road is great for biking. No threat of fast moving cars, just the wind in the trees. The area is very quiet and serene as the birds and critters move about. Kayaking, canoeing, paddle board, airboats and swamp buggy tours close by, within a few miles. The Turner River Road boat launch is very near. You may also be lucky enough to spot a panther from there. Full screened in porches surround the house, a wonderful breeze generally rolls through the house with all the doors open or put on the central air or heat. Pond on the property generally full of resident wildlife: alligator, wading birds, turtles, deer, bobcat, panther, butterflies, wild turkey, bears and more. Spend days wilderness hiking, birding, photography, biking from the house. Exploring the Everglades is an endless journey with few humans in your path. You can also experience the area with world famous photographer, Clyde Butcher. He offers small tour groups. The park rangers also provide walks, maps, advice, etc.. Everglades City is the closest town, 11 miles away, famous for it's local crabs, fishing, nature guides and air boat tours. It is still a quaint village offering shopping for groceries, restaurants and excellent tour guides. 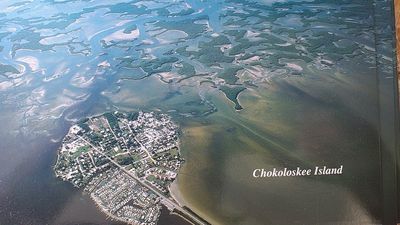 Chokoloskee cemeteries and the Ted Smallwood Store are also worth a visit as well as the Ten Thousand Islands and Marco Island. These islands are salt water fishing destination: snook, grouper, tarpon, red fish and drum are generally caught. This home is perfect for nature enthusiasts, artists, authors,etc...The tranquility will be stimulating. Transportation from either Naples Florida or Ft Lauderdale can be arranged, as well as stocking the refrigerator and other necessities. Sleeping: It is a one bedroom with a brand new king size bed with 100% Egyptian cotton sheets, and comforter. There is also a comfortable futon in the living room, a full size sofa, and a roll away cot. Everything is comfortable, new, clean and fresh. Amenities: It has a very well stocked kitchen of electronics and utensils: range, refrigerator with ice maker, separate deep freeze, microwave,rice cooker, electric tea kettle, electric coffee maker, french press, waffle maker, blender, toaster oven, and filtered well water. 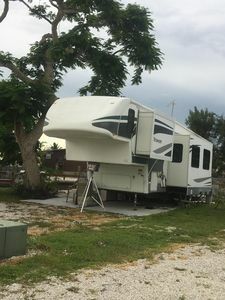 Outside grill, 2 adult bicycles, clothing washer, stereo, satellite TV, internet, Samsung Galaxy 5 cell phone to use while visiting (signal 90%), dvds, pool table, telescope, binoculars, cards, dartboard, ice cooler, backpack, benches around pond. The owner has another small home on the property, a distance away from the main house. It is not likely you will see her but may be available if necessary. Also, *note we had a sun mar composting toilet that some guests found a bit difficult to use. It has been removed and in it's place is a new flushing toilet that everyone will find quite easy to use. Distinct from other houses on the island - We are located on the NORTH POINT of Pleasure Island at Club Everglades. 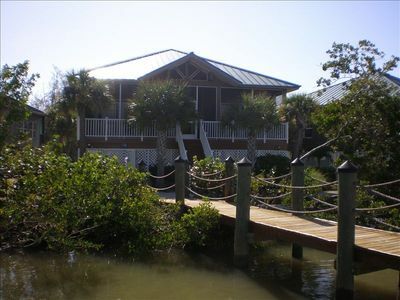 Our home boasts a FULL WRAP-AROUND, SCREENED PORCH AND YARD for fishing from the point. The house offers PRIVACY not found anywhere else on the island. Convenient docking is provided within steps from the house. We have a full dining room and kitchen, which includes microwave, dishwasher, refrigerator, and coffee maker. Additional amenities are full in-house washer/dryer, central A/C and ceiling fans throughout the house and porch. We provide many essentials such as all paper goods, soaps for bath and kitchen, linens, towels, beach chairs and many condiments for cooking to make your stay comfortable. While visiting be sure to RELAX ON OUR PORCH AND SEE MANY SPECIES OF BIRDS OR MAMMALS ( DOLPHIN, ALLIGATOR, MANATEE). Everglades City is known as the gateway to the 10,000 Islands. You can Canoe the mangrove tunnels, Take a fishing and backcountry excursion or Hike through the Big Cypress National Preserve. Escape from the big city to the little City of Everglades! Centrally located to explore the Everglades and other parks in Southwest Florida. 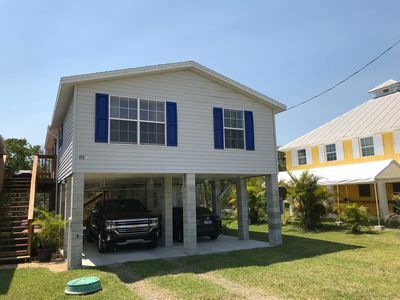 This rental accommodates 5 people and is within walking distance of boat tours and local restaurants. The house is a multi-family property and you will be staying in a 2 bedroom, 1 bathroom apartment on the 2nd floor. 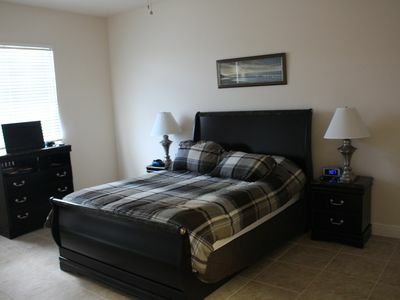 Both bedrooms are furnished with queen beds, and there is a spacious full bathroom with shower/ tub. There is also a full size futon in the living room. All linens are provided. The living / dining / kitchen area has high ceilings and big sliding glass doors that you can open to let in tropical breezes. Or just open the curtains to enjoy the Florida sunshine and amazing sunsets in air conditioned comfort. The kitchen is equipped with plates, pots/ pans and utensils so you can cook your own meals. Or you can walk to several local restaurants. Although not shown in the photo, there is now a flat screen TV in the living room. During your stay you will also have access to wireless internet. 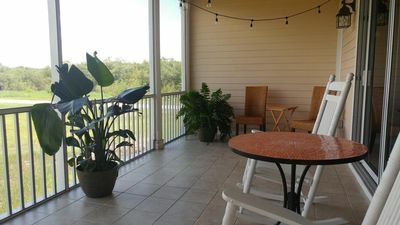 In addition to the apartment, guests also have access to the tropical back yard with patio and hammock. 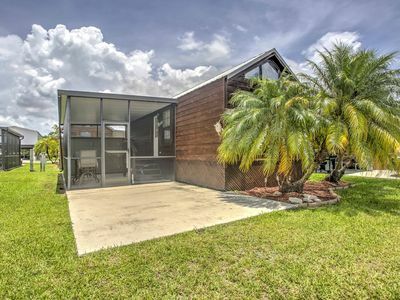 This is a newly renovated home located within walking distance of many attractions Everglades City has to offer! 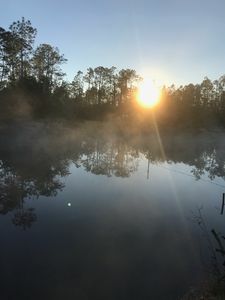 The perfect place to stay whether you are here to explore the Everglades for the first time, or try your lucky at some of the best fishing SW Florida has to offer here in the 10,000 Islands and Everglades National Park. 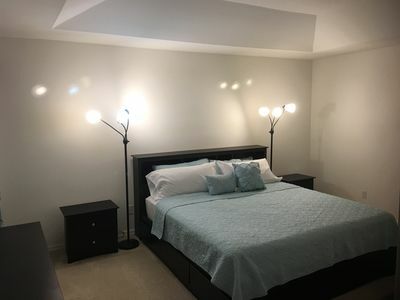 It is beautifully furnished and has top of the line appliances, new kitchen and Large Flat screen TV's in the living and master suite including cable and internet. A beautiful wrap around porch with a water view of Barron River and gorgeous sunset. There is a BBQ Grill, Tennis Rackets ( Courts located at McCleod Park), Kayaks(lots of places nearby to explore i.e. Halfway Creek), Bicycles, all provided to make your stay an enjoyable one. If you are looking for suggestion on what to do during your stay please checkout the people, places, and businesses we recommend in the Everglades Area to make your visit even more memorable. 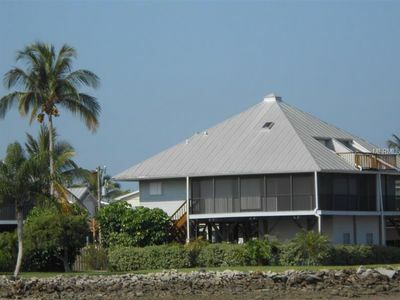 "Everglades Crab House" Everglades Getaway and Stay! With Deep Water Dock! Located in the " Stone Crab Capital of the World", The Everglades Crab House is certain to make your vacation remarkable in every way! You will have an immense amount of room in the large kitchen, dining and living room area for all the friends and family.The kitchen is fully stocked with everything you'll need to cook your "catch of the day", crack your stone crabs, which can be deliverd to your door, and all the while being able to entertain and serve the whole crew of 12-14 guest around the kitchen island or dining table. Equipped with cable TV, WIFI, and plenty of DVD's you'll be sure to have plenty of entertainment, and along with flatscreens in each room, so everyone will be accomodated to their preference of choice for entertainment. "The Alligator Bunk Room" is a definite delight with the younger set, and any overflow guest you may have.This room has a full size bed with a twin bunk and a seperate twin bed. The master bedroom, "Starfish & Sandollars" with ensuite bath will give privacy to those who may desire a bit more serinity, "alone time, bubble bath, coupon clipping tying fishing flies and knots or whatever" along with a sitting area to read or just realx after a long day of vacationing. There is also a "loft" and will tuck away 2 guest with that tree house feel up above it all, this is a fun place for the adventurous ones. "Anchor's Aweigh" has a queen size bed along with nautical flare and will give you that relaxing feeling of being adrift far away from it all. "Tropic Isle" gives you it's full attention with a full size bed and will transport you to that tropical paradise somewhere deep into paradise of palms and orchids Downstairs you'll find storage for any gear you may have and need to store for fishing, kayaking, boating, biking or anything else that needs to be stored. Having a balcony upstairs off the bunk room you'll be able to grill those steaks and chops to perfection all while while watching a glourious sunset. You will have on sight, safe and immense amounts of parking for all your vehicles, boats and trailers without any issues of space along with a dock off site of property. The dock is on deep water, The Barron River. 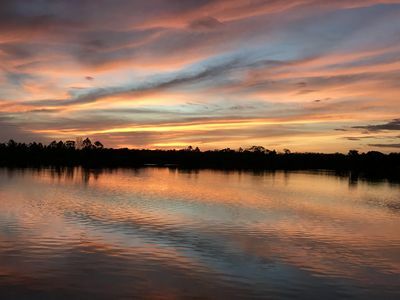 You'll be able to enjoy everything from bird watching, seeing beautiful sunsets, manatees, alligators all while fishing for Tarpon, Snook, Redfish and even occasionally a catfish, or not. 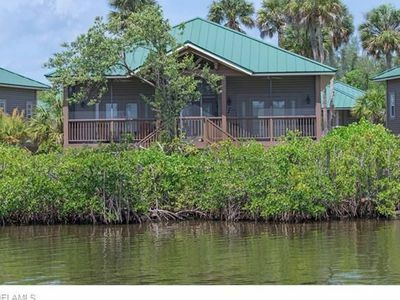 Whatever you may want your getaway to the "Crab House" is certain to give you all the pleasures and room you are looking for from a family reunion, group fishing / kayaking / boating getaway or even a troop trip, Come and stay awhile for a truly memorable Everglades Experience! 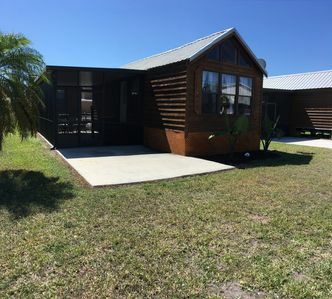 2 Bedrooms/ 2 1/2 Baths, Old Florida Style Cottage, with all the modern conveniences. Enjoy the Florida Everglades at its best - fish from your front yard, fish the Gulf or the Ten Thousand Islands, Kayak, Canoe, Shell. Just sit on your screened porch and enjoy the natural beauty surrounding this serene setting. 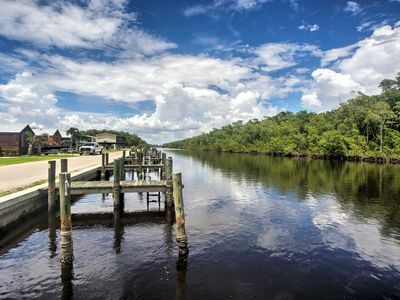 Everglades City, a peaceful small town, offers many good restaurants, boat rides, sight-seeing, fishing, bird watching, hiking, boating, cycling and just 30 minutes away is the City of Naples with theaters, fine dining, shopping. Enjoy the amenities at the clubhouse, pool and work-out room. This makes for the perfect vacation. Dockmaster on duty to shuttle you across the river. This property has a minimum 5 day requirement for booking and must have reservation approval by the association. Our beautiful condo is 3 stories with a 2 car garage. Can sleep up to 8 but can accommodate more if needed. Naples is 39 minutes away, Miami Beach 1 hour and The Keys are a quick 2 hour drive. Definitely doable day trip. Everglades City offers many choices for family owned restaurants such as Camellia Street Grill and Havana Cafe on Chokoloskee Island. Also amazing Airboat tours at Wootens. Ask for JR. Everglades City is a small town with a big heart but close enough to big cities. Private boat ramp with direct Gulf access. 2 car garage can also fit smaller flats boat and truck. Please be advised this condo is 3 stories including garage. Main level is on 2nd floor and bedrooms are on top floor requiring stairs to access both floors. Please enjoy your stay! Water front villa located on the Captain's Table property. The villa has been newly furnished and renovated. Two sliding doors open out on to a large deck with water front views of Lake Placid. Open kitchen with dining table. Private bedroom with king bed. Large sectional couch with a fold out queen bed. WiFi is available in this villa. The villa overlooks the heated pool. Use of the boat ramp is included and is conveniently located adjacent to the property. Full size washer and dryer is also included. The Villa is less than an hour from Naples and Marco and a short day trip from Miami, Ft Lauderdale and the Keys. So you can enjoy all of the amenities of these world class destinations and return to nature at the end of the day. 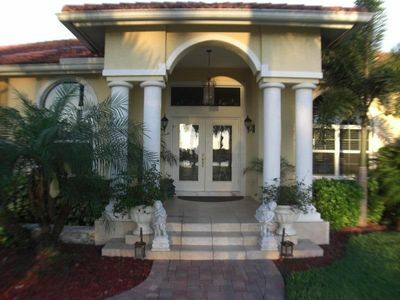 This property offers you the best of what Florida has to offer. 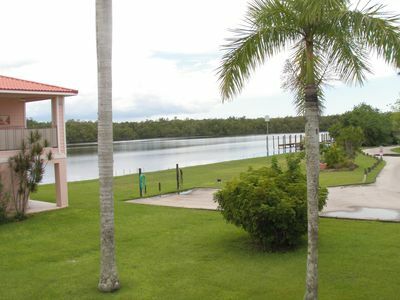 Beautiful one bedroom villa with wide water views located in Everglades City. The villa includes updated open floor plan kitchen with granite counter tops. As well has a luxury bath with a jetted spa tub and separate shower. The deck surrounding the villa wraps around and as an open and screened in area off the bedroom. There are two flat screen HDTV. 50in HDTV /DVD in the living room and a 30 in wall mounted HDTV /DVD in the bedroom. WiFI and Direct TV are included. 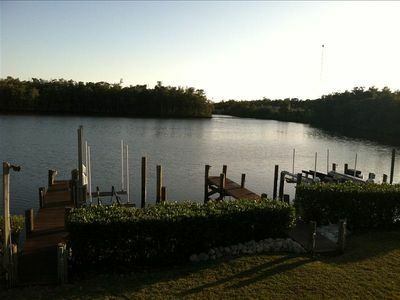 The property includes access to a heated pool and boat ramp at no additional charge. There is covered parking under the villa with room for your car, boat and trailer. Washer and dryer and extra storage are available under the villa as well for your private use. The amenities go on and on! 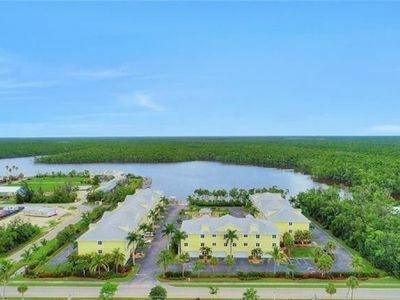 This property offers the comforts of a high end condo or hotel suite in the peaceful natural surroundings the everglades. Yet you are less than an hour away from the hustle and bustle of Naples and Marco Island to the west and 1 1/2 hours away for Ft. Lauderdale and Miami to the east. The keys are a short day trip or overnight stay away as well. This location gives you easy and affordable access to all the best South Florida has to offer. Welcome home! If you’re tired of city traffic and are wanting to get in touched with nature, have some privacy, then this is it. Here is your chance to experience a piece of tropical paradise. Excellent 3Br-2Ba with plenty of space. This Gorgeous home is located in the most desirable part of Golden Gate Estate, plenty of room for outdoor sports etc. 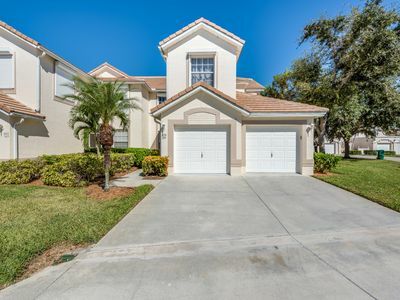 Located in Naples Florida which has been rated as the happiest, healthiest city in the United States 3 years in a row, is this spacious ranch style home along with plenty of parking. The master br features a king size bed with private bathroom and walk-in closet. The 2 br is perfect for children, it has bunk beds, a twin upper bunk and a full size lower bunk. The 3 br features a plush queen bed suitable for teenagers. Additional bedding options are an air mattress and couches to accommodate 5 guest. A 55” TV, DVD player, and Apple w/Apps is available for music, games and movies. Don’t hesitate and book your stay today! Easy Recreation Retreat! 2 Fish, Kayak, Birdwatch RELAX! This 2 bedroom with large living area, TV, WiFi, kitchenette, washer & dryer Has 2 large bedrooms. One has twin beds the other a full size. You will have plenty of parking and storage for any gear you may have to experience that great getaway! You have access to your own dock on the deep water Barron River, there you can fish and veiw a beautiful sunset too! You are sure to have the time you have looked for when coming to the Everglades and the Ten Thousand Islands! Come ON! Enjoy the City! Fishing Frenzy Getaway, #1 Lots of parking and DOCK! Enjoy a quick getaway to catch a weekend of fishing! You will enjoy the immense amount of safe boat a nd trailer parking, along with room to wash your boat after catching a days limit of those coveted fish that you have come to "The Ten Thouasand Islands" for! You will also have access to a deep water dock on the Barron River. After a day of fun, you can relax in the living area with cable TV, WIFI and lots of peaceful serenity. There is a small kitchenette area to prepare your catch or you may even opt to take it to one of the local resturants where they will "cook your catch". Equipped with a convection/ air fryer toaster oven, microwave, electric skillet, toaster and coffee maker, you will be able to cook your meals or enjoy time away from cooking and cleaning. Washing those fishing clothes after a day on the water also helps and everything will be ready for your departure with not much to do when your destination is over. Come on, come fish the islands, and have the memorable time you have been imagining! 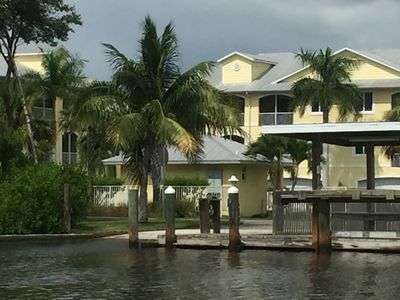 "Everglades Villa With a View" & 2 docks with lifts! 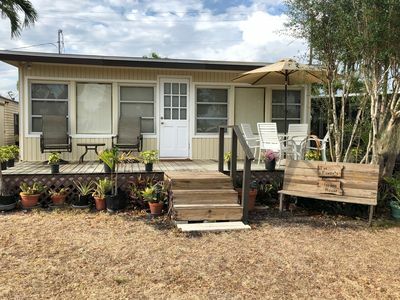 This quaint 2 bedroom, 2 bath Villa with a spectacular view over looking Lake Placid and the waterways surrounding the docks, 2 of which will allow you to keep your boats safely on lifts all the while of giving you a safe, peace of mind, and security. Inside the villa you'll find everything you'll need to make your stay the perfect memorable experience, whether fishing, kayaking, birdwatching or just getting away. Here in the Everglades Villa With a View, you will have a sense of complete relaxation, quiet peaceful and away from all the hustle and bustle of the city you probably left but all the comforts of home. You will have a fully stocked kitchen with dishes, cookware, coffee maker etc. All linens, towels and basic essentials are provided for your use. You will have access to 2 docks both accompanied with lifts for your boats safety after a long day of fishing. 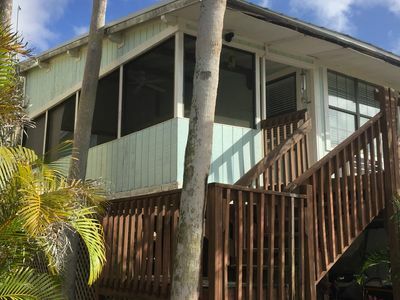 Once back from that good fishing day, you'll be able to cook your catch and relax on the large lanai and have that tropical afternoon tody while looking out over the waterway. You'll be certain to see tarpon jumping, possibly a porpoise or two and even a gator, most likely, this is when you know you are "truly" in the Everglades! You will be able to instantly share any memories, photos and conversations with those back at home that aren't lucky enough to experience what you have today with WIFI that is included. 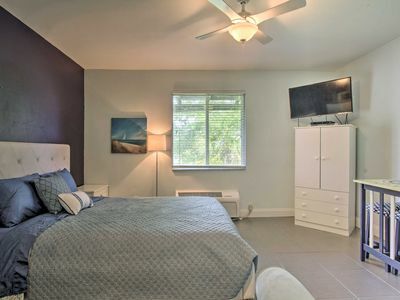 There is satellite TV for your enjoyment and TV's in both bedrooms for those that may want to relax alone. Regardless of what your trip may involve you will be sure to return to "The Villa With a View". This 2 bedroom (both with Queens beds), 2 bath condo has 10 foot ceilings with ceiling fans in each bedroom and the living room. The bathrooms have granite countertops with spacious showers. The master bath has 2 sinks. The kitchen is great! Granite countertops, large sink, and plenty of work space all around the kitchen. The kitchen cabinets are oversized with plenty of room for storage. The living room is comfortable, the sofa is a double recliner. We also have a whole house WATER FILTRATION SYSTEM, which is rare on an Everglades City rental. The TV is an HD TV with Netflix, and we also are one of the few rentals with HIGH SPEED INTERNET with WI-FI and an upgraded cable. We have a screened in lanai with 4 patio chairs and 2 tables. The garage is oversized and will allow up to a 24 foot trailer / boat (measured from the back of the engine to the tongue of the trailer). We also have a hose and brushes to clean your boat after a great day on the water. The property also has a pool located in the center of the condominiums. Damage deposit will be returned 7 days after departure. 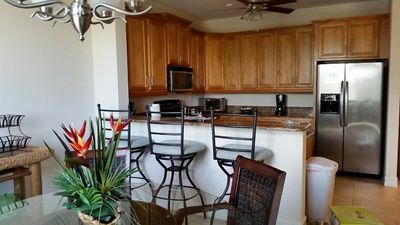 Beautiful Condo in Paradise located in the heart of the Everglades. 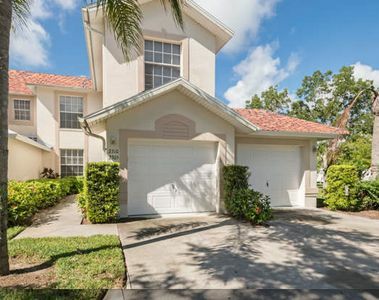 Beautiful 3 bedroom 2 bath condo located in the heart of the Everglades. 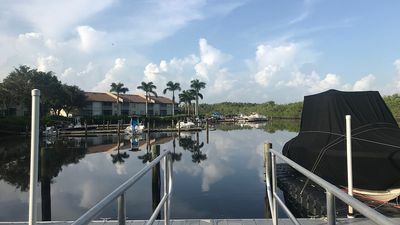 This property is the perfect location for experiencing the all that The Everglades and 10,000 islands have to offer while staying in a spacious fully appointed condo complex. 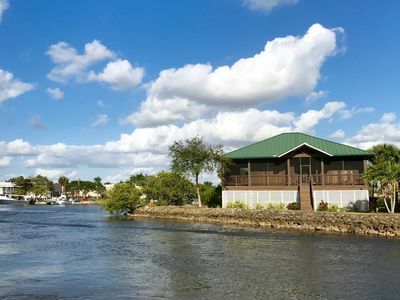 The Estuary at Everglades City is one of the premium property locations in Everglades City. Inside the complex there is a large heated pool with patio surrounded by tables and lounge chairs. As well as a dock and boat ramp on site. This is a great place to relax and enjoy nature. But if you want to go to Naples or Marco Island they are less than an hour away. Miami and the Keys are also close enough for a day trip or over night visit. This location gives you the best of what Florida has to offer. !!!!!!! !THERE IS NO RED TIDE IN THE EVERGLADES AREA !!!!!!!!!!!! Happy Holidays to all.....Although we are almost booked up there are still a few days open. The weather is cooling off and this is the best time to tour the 10,000 Islands. You will find the unit to be completely stocked with all types of kitchen utensils, and pots and pans. As well, there are a full complement of towels, beach towels, sheets, blankets and all other amenities that you would expect in a home setting. Our condo is situated in the middle of the Everglades National park. It is a 2 bedroom 2 bath unit located on the second floor (the ground floor is a private garage for boat storage). The master bedroom has a large bathroom with 2 vanities and a walk in shower. There is also a large walk in closet for your convenience. There is a large outdoor screened lanai immediately adjacent to the living room. The living room has a couch, a love seat, 2 recliners and 60 inch flat screen TV. Cable TV is provided along with hi speed WiFi throughout the unit. The guest bedroom has one queen bed. The second bathroom has a shower/tub combination. 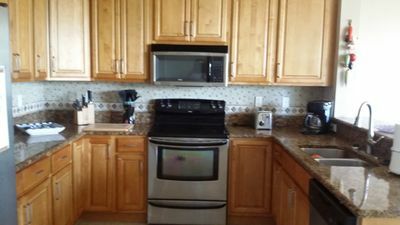 The large kitchen is fully stocked with all pots, pans, cookie sheets, baking dishes and utensils to cook any meal that you can think up. There is a large dining room table that can seat 6. The garage for your boat storage is shared with the owner where he stores his boat and fishing gear as well. You will have 1/2 of the garage for storage of your boat and gear. The dimensions are 23 feet long by 10 ft 6 in wide by 83 inches tall. IMPORTANT NOTE: The Condo association requires that all boats and trailers be inside the garage at night. Therefore, your boat must fit in the space that is described above. Beautiful yet fishing functiona, 3 bedroom 2 bath condo in the heart of Everglades City, The Stone Crab Capital of the World. 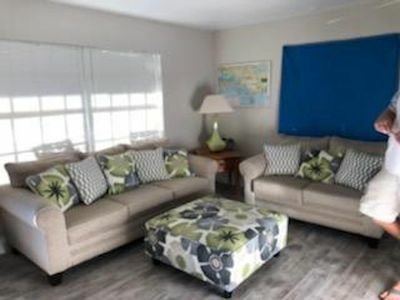 This condo getaway will please even the pickiest of vactioneers, with a beatiful lanai view of the saltwater heated and a/c pool and the lush mangrove water surrounds. You will have plenty of room to launch your boat and then safely store it (up to 23 ) in your own private garage. Once inside you ll experience the calm serenity that you d hoped for your stay. Not only will you have all the comforts of home and probably then some, you have afully stocked kitchen with granite countertops, full size stainless appaliances and a breakfast bar. Adjacent to the kitchen you have a full size dining room, and across is the large living area with curl up cozy chairs and loveseat. Featuring a big screen tv with cable you are sure to be able to watch your favorite game or tv series. 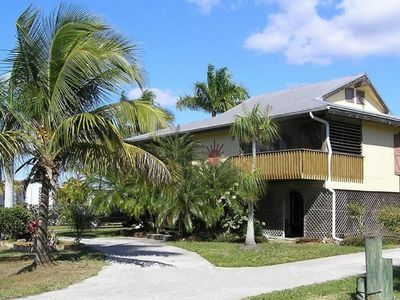 Constructed in 2007, this 2 Bedroom/2 Bath Condo is located in the heart of Historic Everglades City on a beautiful waterfront site. Unit includes full kitchen, in-unit laundry, screened balcony with pool and water view. Unit is completely stocked with new kitchen utensils, small appliances and pots and pans for preparing the catch of the day. There are also plenty of extra sheets, towels, blankets and pool towels. Wi-fi and cable TV provided. Unit includes a 2-car garage for boat storage (trailer and boat CANNOT exceed 24.5 feet in length and 7 feet high). Boats and trailers MUST be stored in the garage per condo rules. Other options are available in the area for larger boats. The property features a private launching ramp. Located in the heart of the Everglades 10,000 Island National Park, the fishing is outstanding. For golfers, Naples is just a 30 minute drive. Kayaking the extensive mangrove islands and creeks is a great way to birdwatch and get a little exercise. Airboat and nature tours just a few blocks away. After a day of outdoor activities take a dip the our private heated swimming pool. Unit features all the comforts of home. Recently upgraded with new paint, new furniture and all new kitchen essentials. Please note, unit is on third floor. There is no elevator. Best fishing in the 10,000 islands Small town lifestyle but within 35 minutes of Marco Island/Naples Florida 2 spacious bedrooms 2 bath fully furnished 2 car Garage lanai Views from lanai of water and pool Kitchen overlooks town city Hall and churches High ceilings Like new Everglade City loaded with old florida history surrounded by water and causeway to Chokoloskee and original county seat for collier county Home of stone crabs and seafood restaurants Family fun with airboat , kayaking bicycling around the island Island tours through 10,000 islands echo tours Indian villages and state park trails Nothing like this in florida Time has stood still here Star filled nights Gorgeous Sunsets Historic Rod and Gun Club visited by past Presidents and the collier family Filmed here Gone Fishing history museum Old fashioned life style in the middle of ft Lauderdale Miami ft Miles all less than 100 miles away Bring your heart and soul and leave with a true feeling of the Everglades !! Up to 10* guests upon availability/rental of Hide -A-Way South at the same time. Country setting home Nestled amongst the soaring pines and palm trees. Enjoy your mornings with a fresh brewed cup of coffee overlooking tranquil water and watching the deers roam. Looking for something to do? Then take a drive to the casino in Immokalee, Ave Maria town,Naples 5th Ave,Marco Island or beaches which are all close by. 2 bedrooms,1 bath featuring two queen size beds, kitchen-net,dining area and living room which has a sofa that can hold a 5th person if needed. Bicycles and kayaks* are provided for your enjoyment . Use them at your own risk! Up to 10* guests upon availability/rental of Hide -A-Way South at the same time. Country setting home Nestled amongst the soaring pines and palm trees. Enjoy your mornings with a fresh brewed cup of coffee overlooking tranquil water and watching the deers roam. Looking for something to do? Then take a drive to the casino in Immokalee, Ave Maria town,Naples 5th Ave,Marco Island or beaches which are all close by. 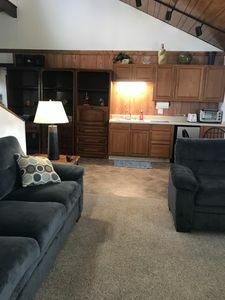 2 bedrooms,1 bath featuring two queen size beds, kitchen-net,dining area and living room which has a sofa that can hold a 5th person if needed. Bicycles and kayaks* are provided for your enjoyment.Use them at your own risk.!! Beautiful waterfront 2Br/2Ba luxury condo in Sunset Cove at Outdoor Resorts of Chokoloskee. The two-story stilt condo offers beautiful sunset views of Chokoloskee Bay. The main floor features a full-sized kitchen, dining room, living room, bathroom, and guest bedroom (two twin beds). Upstairs is the master bedroom with master bath and a sliding door leading to a private balcony directly overlooking the bay. The condo features large screened-in porches on the main floor with water views and seating. We have covered parking for a car and a boat. We are at the gateway to the Everglades National Park and The Ten Thousand Islands offering world class fishing and some of the most pristine natural ecosystems anywhere in the northern hemisphere. We offer monthly and multi-month rentals. Please call for more information and for a multi-month discount. Southern Everglades, THE WAY THE KEYS USED TO BE, warm SALT and fresh-water Everglades wilderness, 10,000 islands. SPARED FROM 2017 HURRICANE DAMAGE! Remodeled 3 bedrooms,2 full baths, large front deck with shaded PERGOLA. Double wide, permanent trailer on wide corner lot. Tiled floors throughout-nice open kitchen with range and oven opens to the great room. Redone both baths. Freshly painted inside outside. Fully furnished. Sleeps 6 to 8. Master suite offers king size bed/walk-in closet/private bath. The guest bedroom has queen size bed. 3rd bedroom offers full-size couch/futon bed plus bunk bed. Internet. Spacious guest bath. Home is located in Chokoloskee marina village with a private deeded dock with associated marine gas and launch. FISH/KAYAK/BIRD watch. WALK to Smallwood museum (famous site of local pioneer history) and Havana Cafe -BEST SEAFOOD -BEST STONE CRAB in season. Local restaurants offer fresh seafood and local STONE CRABS. Near (bikeable) Historic Everglades City and National Park and general aviation paved airport. Short 30-minute drive to Naples (shopping), Marco Island (beaches) and 1 hour to Miami / Ft. Lauderdale airports and action. Close by "fast-cat" boat ride to Key West.This is a perfect spot to relax and enjoy the LAST FLORIDA, NOT DEVELOPED area. 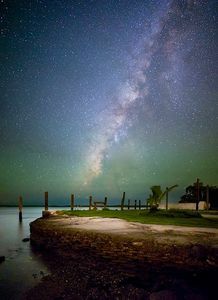 Located on the Southernmost Point of Chokoloskee Island with immediate access to the 10,000 Islands and the Everglades National Park. Private Beach for launching your boat and catching bait, fish cleaning table & snook light on the dock. Fish all night and enjoy your coffee with a beautiful view from the front screened porch in the morning. Plenty of parking for vehicles, boats and trailers. Fully stocked kitchen, flat screen televisions in living and master bedroom. Queen sized beds in bedrooms and a queen leather sleeper in living room. Central A/C with ceiling fan in bedrooms, BarBQ Grill and covered parking. Lovely open great room floor plan ranch style home with inviting outdoor lanai and heated pool. Sit back with your favorite beverage and enjoy the tranquility of an alluring sunset. Large beautifully landscaped lot with ample privacy. Plenty of room for six adults including a master suite with king size bed, second bedroom with queen and third bedroom with twin beds. Den has a trundle bed that would comfortably sleep two additional guests. Home is well equipped with all the amenities for a pleasant stay including fully supplied kitchen, bar-ware, outdoor BBQ grill, WI-FI and pool toys. Cable TV available in living room, master bedroom and second bedroom. Master bedroom has attached bath with large walk in shower and double sinks. Hall bath has Jacuzzi bathtub for an extra dose of relaxation! Upgraded tile and wood flooring throughout, crown molding, vaulted and tray volume ceilings. Golf Course Community that is only $69 for a round and includes cart. Driving range walking distance from home. Or sharpen up your Irons across the street at Naples Links an Executive Course that features Night Golf under Stadium Lighting – all at $25, WOW! Close to Marco Island only 10 min and Naples 5th Ave only 20-25 min. Great quite area with lots of wild life.